I don't understand why many people feel they must blast their part, hotend and heated bed with lots of air. Consider this: blasting a large area with a lot of air can create more problems than it solves - problems like part warping, hot end temperature fluctuations, beds that can't reach and maintain higher temperatures and a host of others. A much better approach - particularly for common filaments like PLA, ABS, PETG, etc - is to direct the minimal amount of air as precisely as possible with laser focus. 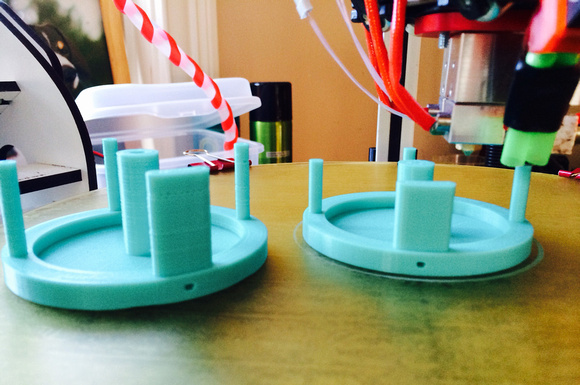 Part on the left was cooled with a typical 25mm fan blasted at the part. This early soda straw air duct concept gave way to a slightly more sophisticated version using several soda straws - one on either side - and ultimately to a 3D printed or machined ring (Re: BerdAir coming soon...). I used this concept on all my deltas (8) until Berd-Air produced their bent aluminum tubing cooling ring. It precisely puts air where it's needed and it is also very low mass on the effector and very low profile so it solves multiple problems. But the air pump is noisy and large. Recently I've refined my design to address the loudness issue by leveraging a normal 25mm fan or squirrel cage fan. I call this new version "the tusk" for obvious reasons (see photos below). 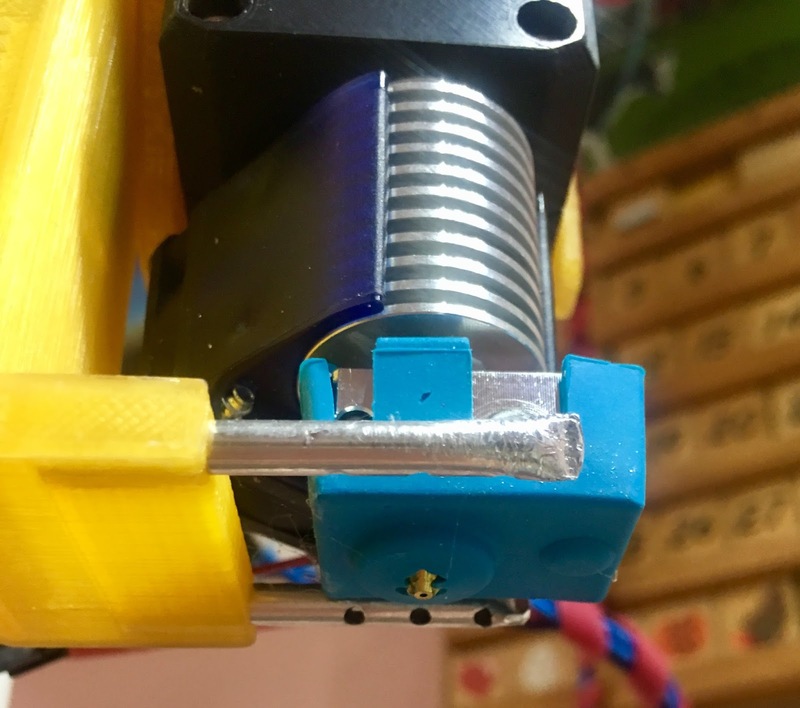 The aluminum tusks allow positioning closer to the heater block for more precise air flow control.The photos below show it mounted on the effector of a SeeMeCNC Rostock MAX V3 with a soon-to-be released new Bondtech mini extruder I'm testing. The "air shell" is low profile and can be located up and out of the way or even designed into an effector or platform if necessary. I'm showing a version with a squirrel cage fan but a standard fan tilted at a slight angle also works well. The tusks are 4mm OD aluminum tubes with 1mm holes. I have a printable jig that is used to align and space the holes for drilling. Then you crimp off the end of the tube. This has the additional benefit of allowing the crimp to be used as a sight to align the holes. With this arrangement, I have 100% clearance, something the three "hovercraft fans" of the stock V3 don't allow. The middle hole on each tusk is centered with the nozzle tip. The air is directed 1mm below the nozzle and can be aimed as necessary with the sight crimps. 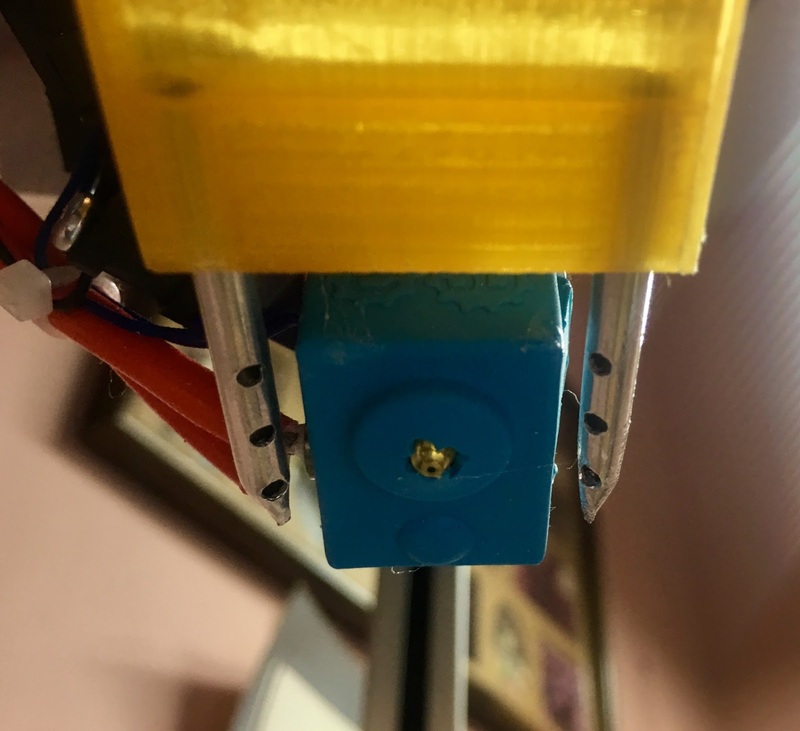 With this precise air flow, you will not introduce thermal stress in your part (see link above), nor will you inadvertently cool your heated bed (especially important at higher bed temperatures), nor will it cool your hot end - especially if you use the E3D V6 sock (which I highly recommend for this and other reasons). I have done smoke tests with this to study the air flow and can verify that it precisely streams air as claimed. The best part is, even with a 25mm fan I rarely need to run more than 50% fan speed. The even better thing is, with this form of directed air flow, you can print longer bridges in PLA and ABS since the cooling air is in the right place to "freeze" the filament as its being drawn across the bridge. And part warpage is non-existent. And thin walls and posts/pillars like those in my fly fishing reel prints that are very difficult to print without distortion using the nuclear blast cooling method print perfectly every time. 17 comments to ''The Tusk Fan Shroud"
Is this setup still something you use? By setup I mean the Bondtech BMG / E3D v6 in combination with the Tusk. Yes, absolutely. I have it on my SeeMeCNC Rostock MAX V3 as I type this reply. Intresting, do you notice any ringing or other negatives due to the increased effector weight? I'm thinking about doing this mod on my V3 as well but it would set me back about €300 due to shipping and taxes. No, but you do have to tune your accelerations appropriately. What are your accelerations if I may ask? 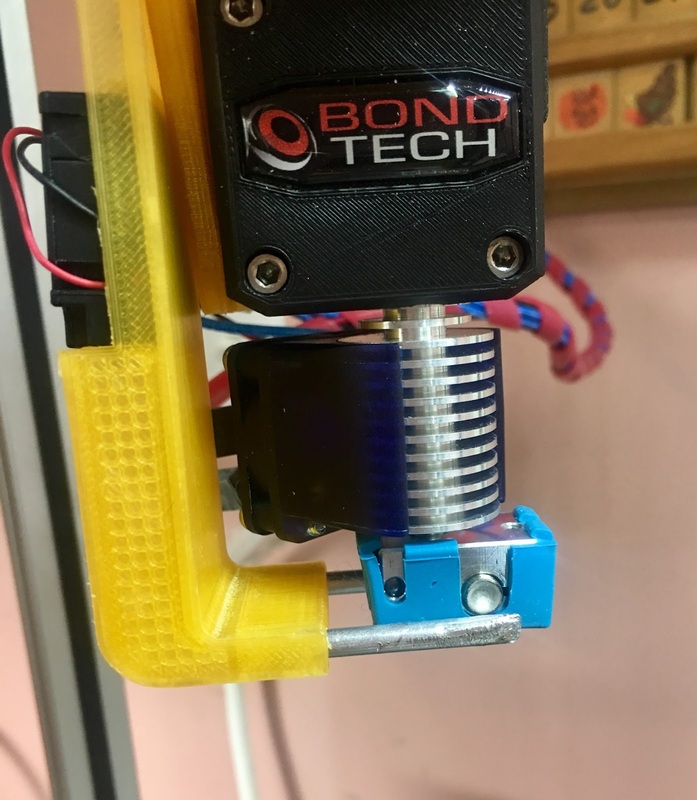 Do you prefer the Bondtech over any of the alternatives like the Titan Aero or even the Zesty. Arne, you have to look at it is a "system". I can't just tell you what I use for accelerations as many other factors come into play. Most importantly is the type of arm joint you are using and the length of the arms (i.e. the size of the delta). 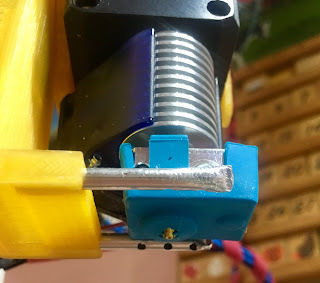 I'm running all of my direct drive extruders except one on deltas with ball cup arms. These can handle accelerations much better than mag balls and significantly reduce/eliminate ringing. On these larger deltas I put the Bondtech at the top of the list in terms of overall utility and reliability and print quality. Followed closely by the Titan Aero. the Aero gives extremely nice prints in PLA (the best I've ever seen in fact) but is not as good at handling PETG and TPU for instance. The Zesty Nimble is not in the same class and I use it for smaller deltas to eliminate Bowden tubes. Since you mentioned earlier you use this setup on a Max V3, I just assumed you were using the stock ball cup arms. I am looking to upgrade my V3 with stock arms/effector. No, I replaced those with TrickLaser CF arms and CNC aluminum carriages and effector. It's easy to tune though. Start with your existing settings, print a cube - say 40mm on a side - at 50, 60, 70, 80, 90, 100mm/s. See what you get. Then decrease accelerations by 50 and print again. It is best to target a practical print speed that you use. I rarely print at 100mm/s and if I do it is to rapid prototype a test so I really don't care if I get ringing (although I don't on my D300VS). I am working on merging the Tusk and your Bondtech BMG mount for the Max V3 into one part. I am adapting it to fit a 50mm squirrel fan. Do you have the design files for the mount available for sharing by any chance? Yes, I should be able to export STEP files for you. I'll try to do that later today. Email me with your email address and I'll send them to you. If I modify the step file to fit the original 40mm fan that comes with the D300VS and keep the tubing distance the same it should work no? Or would the 40mm fan be too much for this setup? I'm actually working on the same thing! The 40mm fan works perfectly. My design is very immature and sort of a back-burner project so go for it. Hi Mike, Hope all is well! I was wondering what fan shroud attachment you were using in your first picture where you used the straws. I'm in need of that same setup and was wondering if you can share the stl? Never mind, figured it out. Any chance of a 40mm version? has anyone looked into developing this for the Kraken in bowden? I've got 4x bmg's connected via bowden to the kraken, which is water cooled.